A photographic identification guide to 239 snake species most commonly seen in South-East Asia (covering Malaysia, Singapore, Thailand, Myanmar, Borneo, Sumatra, Java and Bali). High quality photographs from the regions’s top nature photographers, some of species that have never before been published, are accompanied by detailed species descriptions which include nomenclature, size, distribution, habits and habitat. The user-friendly introduction covers snake topography, how to deal with snake bits and a glossary. 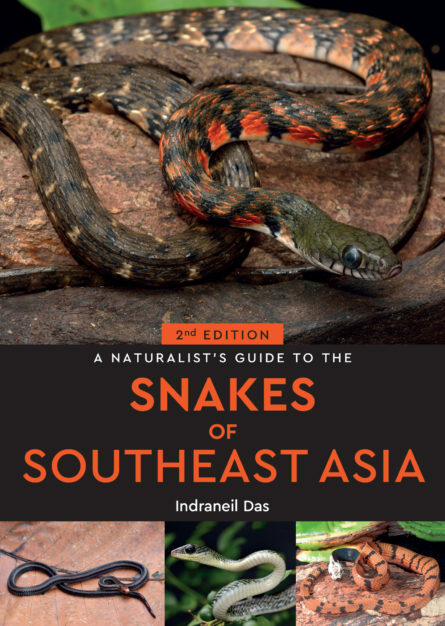 Also included is an all-important checklist of all of the snakes of South-East Asia encompassing, for each species, its common and scientific name, IUCN status as at 2012 and its status in each country. Indraneil Das is Professor of Herpetology at Universiti Malaysia Sarawak. He has a DPhil from Oxford University and was a Fulbright Postdoctoral Fellow at the Museum of Comparative Zoology, Harvard University. He has authored many books on snakes.